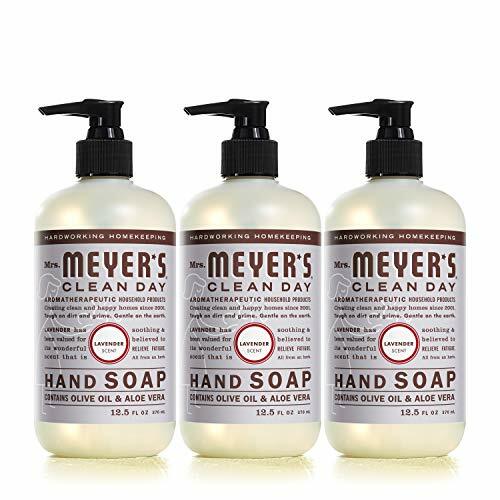 Mrs. Meyer’s Clean Day hand soaps are specifically made to clean and freshen hands without drying, while also providing a special, singular scent for your entire home. Lavender scent has long been prized for its original and clean floral scent. Such a pretty and reassuring herb! This hard-working hand soap formula contains olive oil, aloe vera, and essential oils, that clean and freshen hands. These thoughtfully chosen ingredients create a non-drying yet softening soap for busy hands. Made without parabens, phthalates, animal-derived ingredients, and always a cruelty free soap. Also available in other garden inspired scents and products such as body lotions, laundry detergents, candles, and so much more! Mrs. Meyer’s – rooted in goodness.